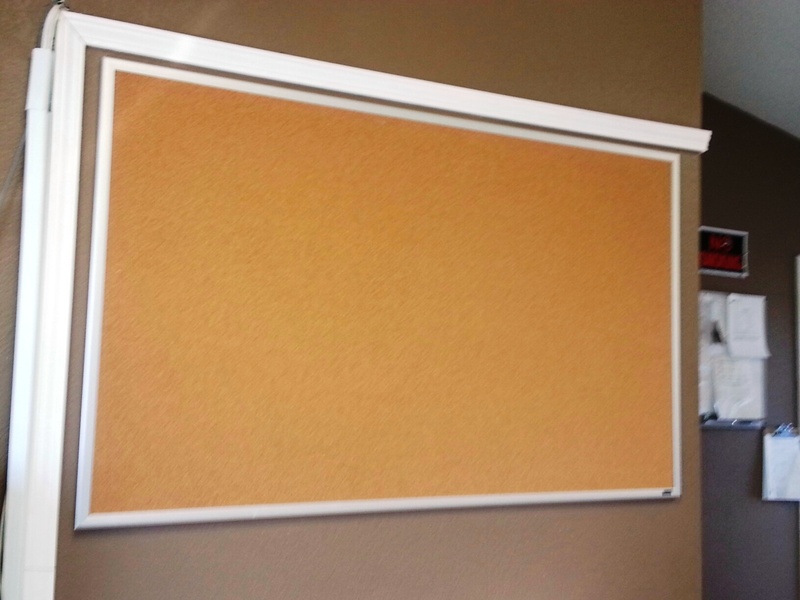 The Powers That Be at my job decided that all locations need a giant bulletin board prominently displayed where we can hang a bunch of reports that no one but me will ever see. My boss decided the perfect place to hang this giant bulletin board is on the wall just a few feet from my desk. Yay. Um… no. Not joking at all. He honestly hadn’t noticed that there was a “way” for the bulletin board to go. He was just going to throw it up there, willy nilly, with no regard for the laws of design or physics or whatever. Seriously, some people!! Want to see the panic-inducing board? THERE. SEE IT?? That little black tag says a word on it and THAT’S how I know which way is up and which way is upside down. And now we can all agree that I have issues and clearly need help. Actually the first thing I noticed was the black tag in the corner! It would have driven me nuts as well. Good for you for sticking up for your mental health! It would have bothered me too, and I knew from the picture, before you said, how to tell. Crooked also drives me crazy. Yup, that’s something that would drive me bonkers. I couldn’t sit in the front row of a church we attended because the outlet on the front of the podium was installed completely crooked and it drove me nuts to look at it. LOL I would have noticed it too… but I admit, if I hadn’t noticed the black tag and I had hung the board, I would have left it as is. So that’s a question for you: if you had hung the board, then noticed afterward, would you have gone to the effort to right it? Why aren’t you the boss? You have an eye for detail. It would bug me, too. When paint or do projects, etc., I have to do it perfectly even if no one else sees it. Patch that little gap under the window trip? I do that. Clean, sand, primer, and paint the top of the door trim THAT NO ONE WILL EVER SEE? Yes, I do that, too. OH yes, an upside down bulletin board would have driven me crazy! We all turn into our mothers eventually, at least a little bit. The world hopes for more passionate writers like you who aare not afraid to mention how they believe. of writing is in fact fastidious, every one can easily understand it, Thanks a lot.